Ronald J. MacDonald began his appointment as the Chief Civilian Director (CCD) of the Independent Investigations Office on October 24, 2017. 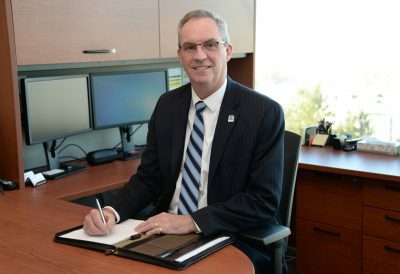 He comes to British Columbia from Nova Scotia, where he held a similar role for the previous six years as the first director of the Serious Incident Response Team (SiRT). Ron has practiced law since 1985 and spent his career working within the criminal justice system. He was defence counsel for six years and then worked for 17 years as a Crown Attorney. He also spent three years as the criminal law policy advisor for Nova Scotia’s Department of Justice. He has further demonstrated his commitment to the previous communities in which he lived, by coaching a variety of sports, chairing boards, and volunteering at the 2010 Winter Olympics. In the mid 2000’s Ron helped to create the first Sexual Assault Response Team in his hometown of Antigonish, Nova Scotia. Ron was the president of the Nova Scotia Barristers’ Society (2005-06) and president of the Federation of Law Societies of Canada (2010-11). In 2007 Ron was awarded the National Heads of Prosecutions Humanitarian Award in recognition of his professional and community efforts. He also received the Nova Scotia Barristers’ Society’s Distinguished Service Award in 2015, and in the same year was named a member of the Schulich School of Law at Dalhousie’s Bertha Wilson Society.